← The Bed Ate My Sock! We hope that you’ve made many new friends this year in the stories that have bedazzled you, made you laugh, and beckoned you to read them again and again. I’ve found many “kindred spirits” this year such as: Juliet and Elizabeth (“The Guernsey Literary and Potato Peel Pie Society”— Yes, that’s really the title! ), Liesel (“The Book Thief”), Claire (“The Son”) . . . and my kiddos have befriended Percy Jackson, Hermione, Anne (with an E), Fletcher (Julia Rawlinson’s fox), Lizzy (Elisa Kleven’s “Apple Doll” girl), and Hedgie (Jan Brett’s hedgehog) to name a handful. We are THRILLED to announce that WhiteFire Publishing Company is releasing our book January 15th, 2019! But how long can the magic last with spring on the horizon? This magical exploration through the colors of the rainbow, the days of the week, and some of our favorite fruits is sure to delight readers of all ages! The Story Behind the Story . . . I say “our book” because my firstborn son, Christian, inspired me with the idea in the first place when he sketched a tree with an ice cream scoop on top . . . I’m excited to share this story, our publication journey and a few sneak peaks of illustrations by Rachael Koppendrayer with you in upcoming posts. Thank YOU Friends for taking this journey with us! 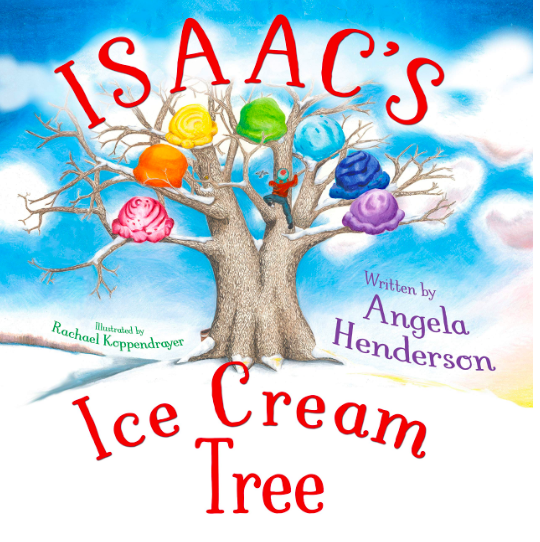 This entry was posted in Friendship, Isaac's Ice Cream Tree, Rachel Koppendrayer, Illustrator, Rainbows, seasons, snow, WhiteFire Publishing Company, winter and tagged Anne of Green Gables, author Angela Henderson, birthday gifts for children, children's rainbow books, children's season books, Easter gifts for children, Elisa Kleven, Harry Potter, ice cream, illustrator Rachael Koppendrayer, Jan Brett, Julia Rawlinson, New Year, Percy Jackson, picture book, Roseanna M. White, seasons, The Book Thief, The Guernsey Literary and Potato Peel Society, The Son, Valentine's gifts for children, WhiteFire Publishing, WhiteSpark, winter. Bookmark the permalink.